While we think the odds are strongly stacked against it, particularly given the government’s furious pace of money printing, the prudent investor understands – and respects – the time-tested adage, “Nothing is guaranteed.” So while our chips sit squarely on the spot marked “inflation,” what will happen to gold stocks if we’re wrong? The most notable example of what happens to gold stocks in a prolonged deflationary environment is the Great Depression. However, the United States was on a gold standard at the time, so miners had a guaranteed selling price – which was a good thing for them, because their operating costs were plummeting. So the comparability isn’t perfect, but let’s see what we can learn. When the stock market crashed in 1929, gold stocks were part of the general wreckage (sound familiar?). The market then rallied and recovered almost 50% of its losses by April 1930, with gold shares again tagging along. It’s what happened next that gives us our first clue about deflation’s effect. When the bear market resumed in the summer of 1930, all securities sold off again – except gold stocks. Gold shares stayed basically flat until early 1931, when they boarded the elevator and headed for the penthouse. Let’s look at how shares of Homestake Mining, the largest gold miner in the U.S. at the time, and Dome Mines, Canada’s senior producer, performed during the Great Depression. And the chart doesn’t show that you could have bought both stocks at half their 1929 price five years earlier, which would have led to gains of around 1,000%. And get this: both companies paid healthy and rising dividends as the depression wore on; Homestake’s dividend went from $7 to $15 per share, and Dome’s from $1 to $1.80. Yes, volatility was high in the gold stocks throughout the depression, with occasional wild price swings, but after the 1929 crash most of the volatility was to the upside. The bottom line is that the two largest gold producers – during a time of soup lines and falling standards of living – handed investors five and six times their money in four years. 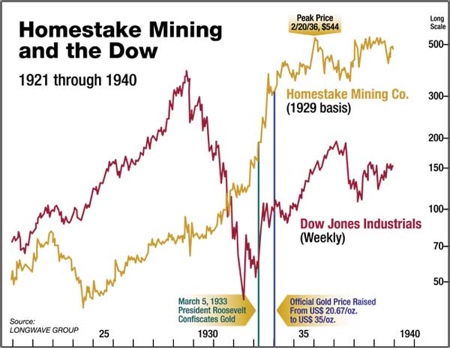 You’ll notice the large spike down in both Homestake and the Dow during the 1929 crash… but then look at Homestake’s recovery immediately afterward, returning close to its old high. This is eerily similar to our recent pattern: our stocks sold off violently last October but have since doubled or more from their bottoms. You’ll then notice that Homestake took almost two years to exceed its old high, but once it broke out, it was off to the races. The stock doubled four times in five years during a seven-year run to its peak after the ’29 crash. The conclusion? If history is any guide, gold stocks can hold their own against deflation. And they could profit tremendously if the demand for gold as a safe haven continues to grow. On April 5, 1933, President Roosevelt issued an executive order forcing delivery (confiscation) of gold owned by private citizens to the government in exchange for compensation at the fixed price of $20.67/oz. And less than nine months later, he raised the gold price to $35, effectively diluting the dollar in every wallet 41% overnight and swindling everyone who had turned in his gold. We don’t know exactly what an untethered gold price would have done during the depression, but given its distinction in history as a store of value, it’s likely to retain its purchasing power in a deflationary setting regardless of its nominal price. In other words, while the price of gold might not rise, or could even fall, your best protection is still gold. But with this said, the overriding concern is that in a fiat system, any deflation will be met with an inflationary overreaction (as we’re seeing). And the worse the deflation, the more extreme the overreaction will be. It’s for this reason that the editors of BIG GOLD urge you to own physical gold, in your possession and under your control, given its reliability as a store of value in both inflationary and deflationary environments. If you have less than our recommended one-third of your investable assets in some form of gold, check around for places to buy gold coins and bars at good premiums. For those with an inclination toward silver, our research points to clear signs that silver is increasingly being viewed as a store of value and not just as an industrial metal. If silver were viewed solely as an industrial metal, the price would be off sharply. This doesn’t mean we think silver or silver stocks can’t go temporarily lower from here, but rather that the demand for silver as a store of value metal will be growing. Bottom line: Whether we’re served debilitating deflation or insidious inflation, holding gold (and silver), along with an appropriate allocation of precious metals stocks, offers us both a fort for protection and a canon for profit. Buying physical gold and silver as safe-harbor assets is for many investors a no-brainer at this point. But only a few have heard of another prudent gold investment – one that has gone up more than 50% in 2008, at the exact same time when the overall stock market bombed. You don’t want to miss out on owning this “48 Karat Gold” stock… click here to learn more.